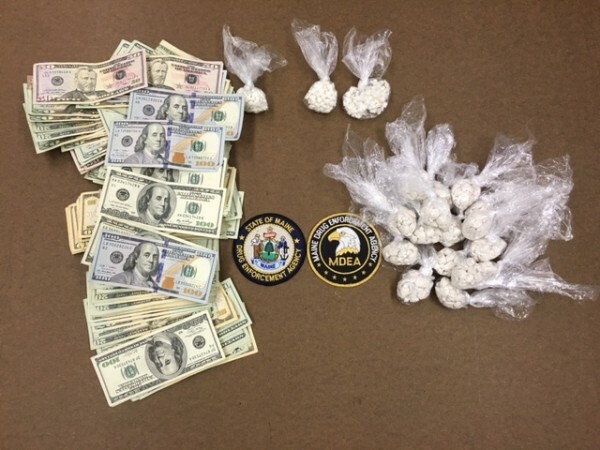 Three men were arrested early Thursday morning on aggravated drug trafficking charges after officers from multiple agencies allegedly seized 166 grams of heroin packaged for individual sale and 30 grams of crack cocaine — with a total street value of $26,000 — as well as $4,780 in cash, from their hotel room in Saco. BIDDEFORD, Maine — Three men were arrested Thursday morning and charged with aggravated trafficking in heroin after two other people died Wednesday of suspected heroin overdoses. Elqui Javier, 21, of Bronx, New York, Rasmane Sankara, 39, (known as “Jamaican Bob”), whom police described as being from Africa, and Christopher Ayotte, 45, of Biddeford, were arrested at a Saco motel early Thursday morning, according to a release from Stephen McCausland, spokesman for the Maine Department of Public Safety. Agents from the Maine Drug Enforcement Agency in York County assisted Biddeford police on Wednesday with the investigations of two suspected drug overdoses. One man was found dead in a vehicle in the parking lot at Southern Maine Medical Center, and the other was found dead in a residence elsewhere in Biddeford, McCausland said. Agents conducted surveillance of the Brookside Hotel in Saco, searching for a man using the street name “Jamaican Bob,” who was allegedly selling large amounts of heroin and crack cocaine from a room at the hotel. At about 2 a.m. Thursday, MDEA agents, Maine State Police troopers, Saco police and U.S. Drug Enforcement agents raided the room and found the three men inside. A state police drug recognition dog allegedly helped police locate and seize 166 grams of heroin packaged for individual sale and 30 grams of crack cocaine — with a total street value of $26,000 — as well as $4,780 in cash. The three were arrested and taken to York County Jail. Police said Javier was violating parole from New York on first-degree robbery charges. New York has asked that he be detained pending extradition. His bail on the Maine charge was set at $250,000 cash. Sankara’s bail was also set at $250,000. According to U.S. Immigration and Customs Enforcement, Sankara came to the United States in 2007 and his work visa has expired. He has been convicted of drug crimes in New York, according to McCausland. Ayotte’s bail was set at $100,000 cash. Additional charges are expected as MDEA agents and Biddeford police continue to investigate the overdose deaths.